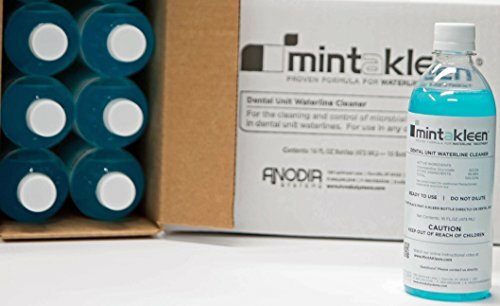 Mint-A-Kleen is the leading liquid dental unit waterline cleaner. Mint-A-Kleen is the only EPA registered chlorhexidine product to clean dental unit waterlines (EPA #:85298-2). Mint-A-Kleen directly contacts the microbial contamination on the walls of the dental water bottles and waterlines with a convenient three-step, once-per-week process. Cleans waterlines over night! Mint-A-Kleen's treatment alone meets ADA and CDC water quality standards. Mint-A-Kleen is the only product needed for cleaning waterlines - does not require the use of water treatment products (i.e. tablets, powders, cartridges or filters). Compatible with all dental unit water systems. ECONOMICAL: $3.00/week per operatory! A single 16 oz. Mint-A-Kleen bottle will clean one operatory for an entire month. No need for supplementary products and no water treatment is necessary. Ready to use with no mixing. Formulated without harsh chemicals. Directly contacts waterline walls and bottles - thoroughly treating, cleaning and protecting them from buildup of microbial contamination. Plus, the ingredients will not corrode, clog, or leave residue in waterlines, bottle or equipment - meaning that dental offices avoid additional expenses from wear and tear. No impact on bonding. EPA registered for sale in all 50 states. For questions, contact Anodia Systems, we're the experts in dental waterline cleaning. Mint-A-Kleen 6 Bottle Pack (24 Treatments). One Mint-A-Kleen treatment lasts a week per operatory. Each bottle is 16 fl. oz. Mint-A-Kleen is the only EPA registered chlorhexidine product to clean dental unit waterlines (EPA #:85298-2). Mint-A-Kleen is the only product needed for cleaning waterlines. No shocking necessary. Mint-A-Kleen's treatment alone meets ADA and CDC water quality standards. Does not require the use of water treatment products: tablets, powders, cartridges or filters. ECONOMICAL: $2.45/week per operatory! A single 16 oz. Mint-A-Kleen bottle will clean one operatory for an entire month. View More In Water Treatment & Equipment. If you have any questions about this product by MINTAKLEEN, contact us by completing and submitting the form below. If you are looking for a specif part number, please include it with your message.